* Building a comprehensive postmerger integration plan-how to align diverse corporate cultures, develop training and reward programs, and move beyond the turf wars and lack of productivity that hamper the success of mergers and acquisitions. Last year more than 7,000 mergers and acquisitions were completed, with a collective price tag estimated at more than $800 billion. And although they are known as highly effective means of achieving corporate growth and strategic advantage, these transactions are fraught with pitfalls: Statistics indicate that a third of these deals will fail and another third will not bear out the expectations of the merger partners. What can businesses looking to undertake strategic mergers and acquisitions do to ensure that they do not fall victim to confusion, multimillion-dollar losses, declining market share and profits, or any number of other negative results of failed transactions? The answers are in Winning at Mergers and Acquisitions, a pioneering step-by-step guide to growth-driven planning and swift, effective post-merger integration. 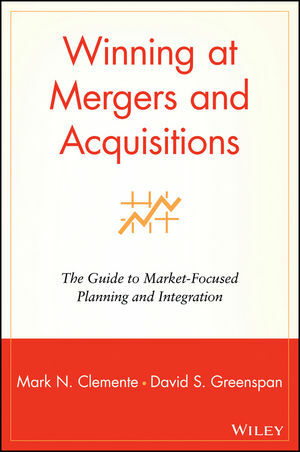 Challenging the conventional emphasis on cost-reduction synergies, this book presents the authors' groundbreaking blueprint for mergers that yield strategic synergies and high returns in meeting long-term growth, increased market share, and revenue generation objectives. Mark Clemente and David Greenspan explore in detail the marketing, sales, and organizational issues that are vital aspects of successful M&A ventures. They take executives through the entire strategic M&A process-from setting objectives, to evaluating target companies, to aligning corporate cultures in an effort to ensure problem-free integration. They show how to maintain a sharp focus on the markets that will be reached by the merger-and they offer invaluable advice on charting a steady course through the often tumultuous period of integration, when organizational chaos can cause the merged company to lose momentum, market share, and the backing of customers, prospects, and shareholders. Winning at Mergers and Acquisitions is essential reading for CEOs, managers, deal makers, and others looking to capitalize on one of the most important methods of effecting corporate growth in business today-while staying focused on the people, product, and process issues that power that growth. MARK N. CLEMENTE, president of Clemente, Greenspan & Co., Inc., has twenty years of experience in marketing, business development, and acquisition planning. He has handled consulting assignments for Fortune 1000 clients and major middle-market firms, and is the author of The Marketing Glossary: Key Terms, Concepts, and Applications. DAVID S. GREENSPAN, cofounder of Clemente, Greenspan & Co., Inc., has spent more than fifteen years analyzing companies as targeted investments and acquisition candidates. He has developed strategic marketing, sales, and communication programs for companies engaged in mergers, acquisitions, and corporate restructurings. Mr. Clemente and Mr. Greenspan are frequent speakers before major business groups on the topics of predeal planning and postmerger integration. STRATEGIC PERSPECTIVE ON M&A PLANNING. "Marketing Due Diligence" in Strategic Mergers and Acquistions. Quest for Strategic Advantage Through Mergers and Acquisitions. Essence of Strategic Mergers and Acquisitions: Focusing on Revenue Enhancement. Evaluating Market Dynamics: Starting Point of Target Company Examinations. Analyzing a Target Company's Products and Product-Development Capabilities. Analyzing the Target Company's Customer Base. Evaluating a Target Company's Employees: A Skills-Based Approach to Personnel Decision Making. Analyzing the Target Company's Management Functions and Processes. Understanding and Acting on the Challenges of Postmerger Integration. Analyzing and Aligning Corporate Cultures. Aligning Products and Product Management Processes. Employee and Organizational Communication Strategies. Training: Catalyst of Integration and Skills Transfer. Reward and Recognition Programs and Employee Motivational Techniques. Postmerger External Communication Strategies Supporting the Merger's Launch. Designing the Merged Firm's Organizational Structure: A Framework for Decision Making.